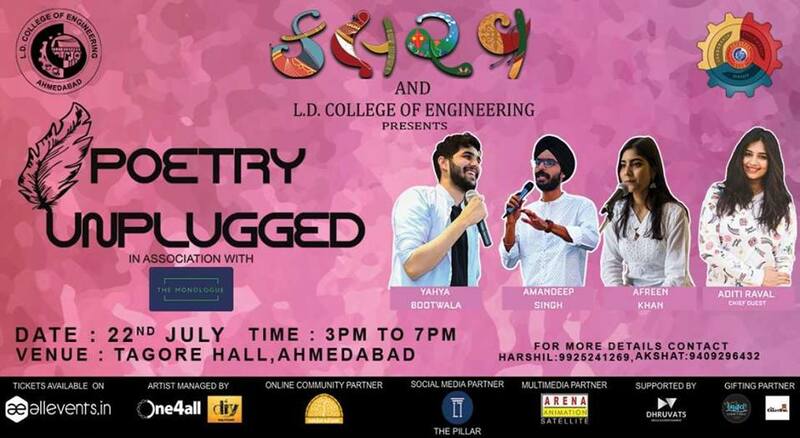 Poetry Unplugged: Yahya Bootwala, Amandeep Singh and Afreen Khan Live. India now has a blossoming array of literary fests and events that celebrate poetry and story-telling. This monsoon, instead of curling on the couch with a book of poetry and a cup of coffee, get up and move out for a heart touching poetry meetup, POETRY UNPLUGGED. We bring to you an opportunity to experience the best of the words, woven into beautiful poems and stories by the eminent youtubers. The man behind “Shayad woh pyaar nahi”, Yahya Bootwala along with Amandeep Singh and Afreen Khan will be coming to enliven us with their mesmerising words. Grab a chance to behold the talents that have encouraged all of us to bring the poet within us to lives. So come and discover your own love with the words. Glean tips and tricks and words of advice from those who are master in this craft. You are invited to be inspired, enchanted, motivated and enlivened.